With both immigration and North Korea being top issues found in today’s news, use this resource to introduce students to North Korea, the refugee crisis, and issues of immigration. Students will watch the TED Talk using the questions provided, reflect on what they heard, and apply what they learned to issues of immigration in the US and elsewhere. My students were very engaged in this TED Talk and loved the extension activities suggested. In this talk you hear about the story of a woman who fled her native North Korea and the struggles she faced as an illegal immigrant. 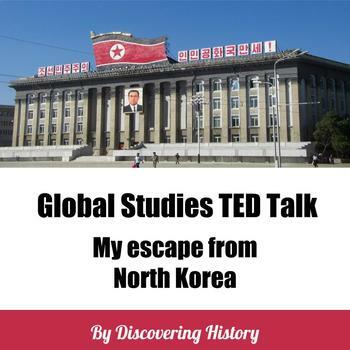 This lesson is suitable for any course covering world issues and current events, modern Asian history, or North Korea. I hope your students enjoy this lesson as much as mine did! For more resources for teaching global studies and history, check out my store on TPT: Discovering History.